5 9:13 When is the turn around? 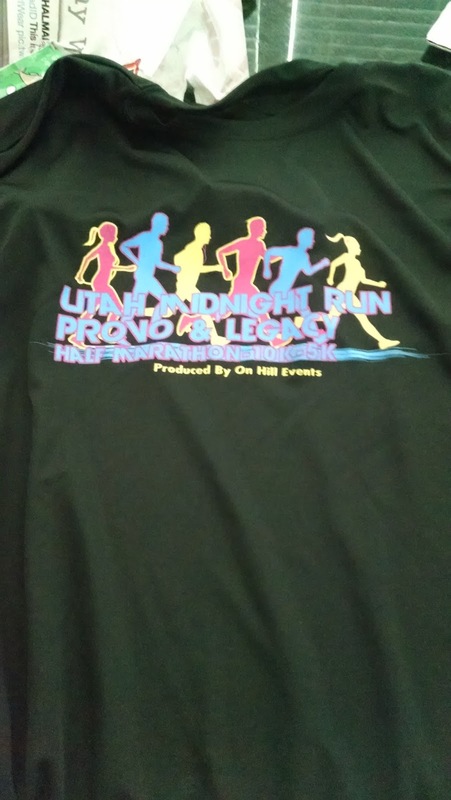 A summer tradition for me, since 2012, is to run the Legacy Midnight Half Marathon. The run is held in the middle of July during a full moon along the Legacy bike trail. I've run the trail many times for many races and it is generally flat but not terribly exciting. 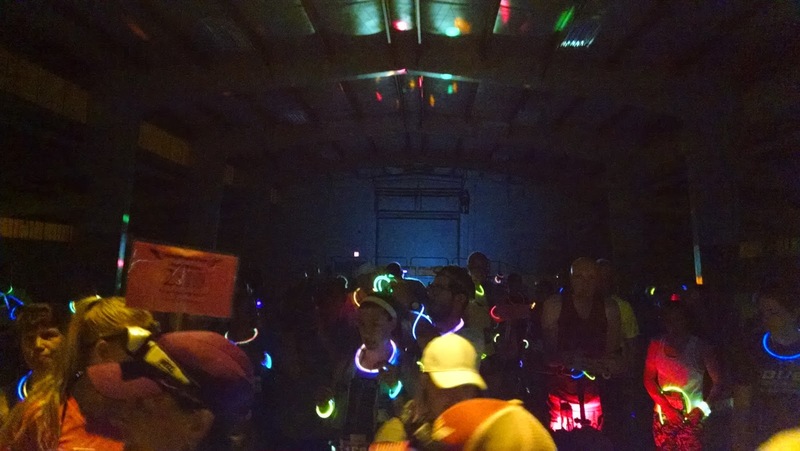 However, running at night while wearing glow sticks adds a unique element to it. I signed up for the race this past winter on account of a nice coupon code. Generally, the longer you wait to register the more expensive it is. But signing up early with the coupon code brought this race down to a no-brainer -- and besides I knew I was going to want to run it. This year there was a bit of a wrinkle. Normally you get to the Legacy Events Center, located in Farmington Utah, board a bus and get transported roughly 13 miles to North Salt Lake. You hang around for about an hour and then start to run north back to the Legacy Event Center. This year, however, there was construction on the trail that prevented that from happening. So, the finish line this year was the start and you ran about 6.50 miles, turned around and came back. I sort of liked this new format -- I could arrive later and have nice clean bathrooms to use before the start. I showed about an hour before the race, grabbed my bib and prayed it would cool down -- just a little bit. My car said it was about 92F and the forecast said it would drop to 89 by 10PM. I knew it was going to be a tough one. And to be honest, I really wasn't in the mood to race, let alone run. I hadn't slept much the night before and with the temperatures as hot as they were, I knew this was going to be a slugfest. The race started exactly at 10 PM. I always like it when a race starts on time. I started off with what I felt was a conservative pace. I was hoping to hit about 8:45 - 9:00 min per mile and just try to hang on as long as I could. It was hard to judge my pace though. The trail was dark and it was hard to read my Garmin. Also, when it is dark, it is hard to judge. I just hung on as best as I could and as the miles ticked off on my Garmin, I adjusted my pace. I knew by mile 3 this wasn't going to be "my" race. Up to this point, my pace was consistent but I felt like things were going to get tough -- and soon. I was also getting passed periodically. And it seemed like those passing me felt like it was an easy pace. As the race progressed I found myself running by myself. There was no sight of any pacers and I could see a distant light bobbing ahead. Occasionally, a half marathoner would pass me, but for the most part it was lonely business that night. By mile 5 I was praying that the course was going to be short. Already some of the lead pack was coming back and it made my heart sink that I had so much more to go. By the time I hit the turn around point -- roughly 6.45 miles into the race, I simply wanted to walk. I knew my ego wasn't going to allow me to do that and after seeing that I was still in a reasonably good position (overall) I kept going. As the race progressed, I saw my splits go from 10 minutes to higher. I was starting to get really hazy in the final 5K. There had been water stations every 1.5 miles that were amply stocked. Kudos to the race director for the ice cold beverages. But I am fortunate that I brought my own hydration as well. I was drinking greedily at it (by the time the race was over, I had gone through all of it). 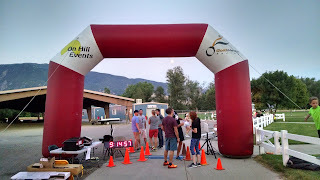 I had hoped that running into the 10K racers (who had started at 11 PM) would motivate me. But it really didn't. I was still running faster than most of them. The 5K didn't inspire me much more either. I kept telling myself I really didn't care what my time was, I just wanted to finish. But the competitor in me was doing whatever I could to make an honest showing. The final stretch finally came and we crossed a service road and back onto the driveway to the events center. It seemed like the final .75 of a mile couldn't come fast enough. I had picked up the pace every so slightly as I knew the end was near, but to be honest, I was on the verge of cramping, my shorts were sopping wet and I was a mess. I was really glad just to finish. After a week of eating all the wrong food, not running a lot (the only other run I did this week was the 4th of July 5K) and with obscenely hot temperatures, I knew this race wasn't going to be a good one. I grabbed my finisher's medal and quickly refilled my container with ice cold water. There were a lot of other people with the same thoughts as I had finished with a bunch of 5Kers and 10Kers. It seemed to take forever and I felt like I was going to pass out. Mercifully I got some water and walked around a bit. The race finishes inside a hall with loud music, strobe lights, and snacks and refreshments. It was just too much for me and I made my way over to the bathrooms, which were a bit of a hike, to get out of the building. I had found a drinking fountain before the race and I had the most delicious ice cold water of the night. I made my way back into the hall and was going to grab a snack and hit the road. I was exhausted and whether I had gotten an age group award was inconsequential to me. I spotted a friend of mine who I run into periodically and wanted to share my greetings before hitting the road. Turns out, after last year's race he had kindly grabbed my age group award and had had it in his car for the past year. Wow... he had won the 10K so I waited until the awards were given out for that and he had received his. 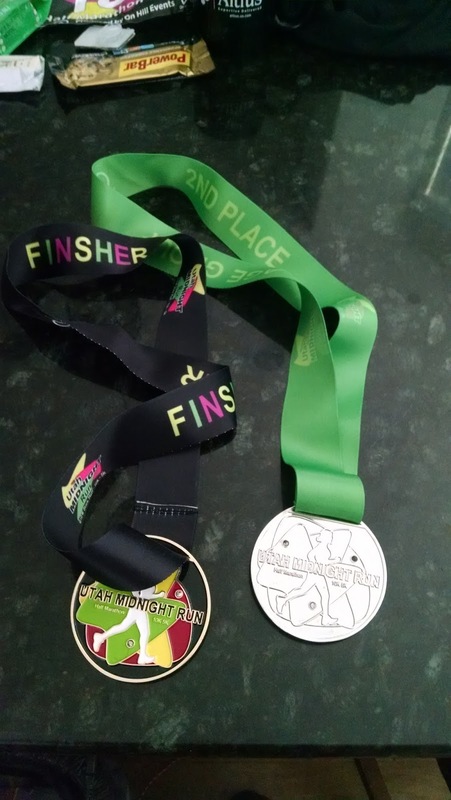 So the medals at the top of the page are the finisher's for this year (which was identical to the Utah / Provo Midnight Half Marathon) and the age group medal from last year. Overall, I was disappointed with my performance. I knew it was going to be a tough race but I had hopes that it would be "my" night. I am still curious as to where I finished, overall, but when I finish post 2:00 hours for a half, I know it wasn't my day. The course I knew and had run many times. It was fairly flat but to be honest, a little boring. I've just run it a bunch of times now and pretty much know every turn. There wasn't a lot to look at to keep my mind off how badly I felt I was doing. The race was well supported and well marked. The first year I had done the race I had nearly gotten lost, but this year, like the recent past, it has been good. I really didn't need my head lamp except at the very beginning. I really wished I had left it at home. I felt the course was a little short. I came up at about 12.92 miles. I'll have to see if I run this one next year. 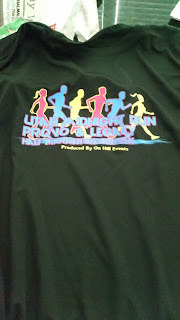 Doing both the Utah and this one doesn't make a lot of sense since the t-shirts and medals are the same. This one, however, is better attended and the competition more fierce. I do like the party scene afterwards, but this year I was definitely not in the mood for it -- due to a lack of sleep. In closing, this race was one I'd like to forget. It was just painful from the get go. On the plus side, I did finish (without stopping) and earned my medal. Some races are like that and I try not to beat myself up too much about it.